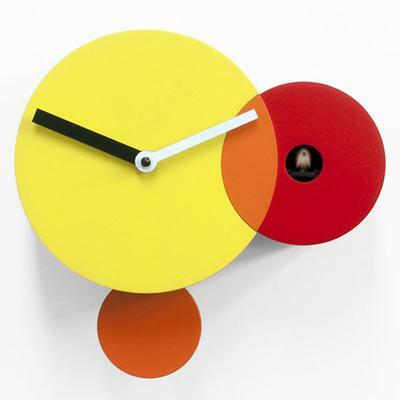 Inspired by the great artist, Wassily Kandinsky, this lovely modern clock features a variety of circles in vibrant colour. It's perfect for the living room, kitchen or even bedroom where colour and design is prioritised. 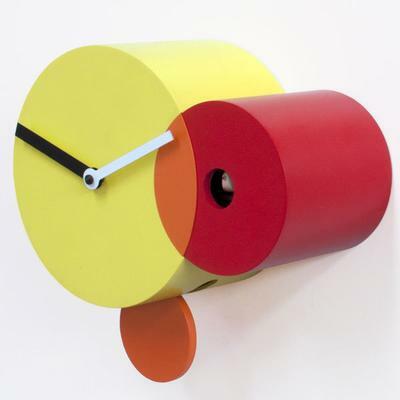 The clock features a two big circles, one in yellow, the other in red. The red one comes with a cuckoo bird hidden in the middle. It comes out every hour to tell the time. While the yellow circle holds the black and white clock hands. There's also a light sensor in place to prevent the cuckoo bird from making any noise during sleeping time. This is wonderful timepiece ideal for your home. You can also purchase this as a gift to someone. Whether it's for a housewarming party or an anniversary, it will be appreciated.